Following its 2010 report, A Vision for High-Speed Rail in the Northeast Corridor, Amtrak released a follow-up report, The Amtrak Vision for the Northeast Corridor, which puts forth a framework for bringing high-speed rail service to the Northeast Corridor. 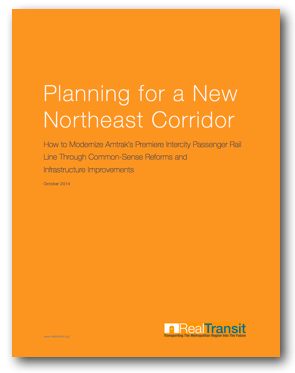 From Washington to Newark, the improvements suggested by Amtrak’s 2012 report are similar to Real Transit’s suggested improvements to the southern section of the Northeast Corridor, which include catenary renewal and replacement, signal and power upgrades, and track infrastructure improvements to allow for increased capacity and speeds. However, from Newark to Boston, there are numerous differences worth highlighting. Amtrak’s Gateway Program proposes the construction two new tracks over 10 miles from Newark to Manhattan. Included within this trackage would be two replacement Portal Bridges over the Hackensack River, which would connect to an expanded Secaucus Junction. Upon leaving Secaucus Junction, the two tracks would travel east towards two new single-track tunnels passing under Bergen Hill and the Hudson River into Penn Station. Upon arriving into Manhattan, the two new tunnels would link to a single-track connector to Penn Station before ultimately terminating at a four-platform, seven-track annex station called Penn Station South, which would be built one block south of the existing Penn Station structure. The Gateway Program also calls for an eastern extension of the 7-Line Subway from 34th Street and 11th Avenue to a new station at 30th Street and 7th Avenue, which would also connect to the new Penn Station South annex. Preliminary estimates from The Amtrak Vision for the Northeast Corridor put the total cost of the Gateway Program at approximately $15 billion with a projected completion year of 2025. Amtrak’s Gateway Program has noble goals and would result in much-needed increases to cross-Hudson capacity from Newark to New York, which would allow for the eventual incorporation of faster and more reliable high-speed intercity service. 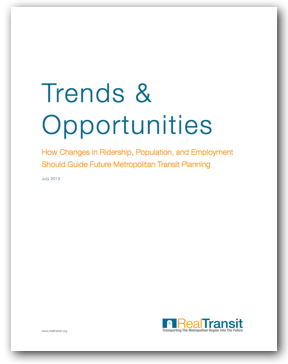 Nevertheless, the Gateway Program fails to sufficiently address the broader transit challenges facing the New York metropolitan region and, as a result, provides neither a comprehensive nor cost-effective solution to the longstanding problems that have plagued this segment of the Northeast Corridor for decades. One of the Gateway Program’s greatest shortcomings is the enormous expense required to deliver relatively few benefits to the nearly 20 million residents of the New York metropolitan region who rely on the Newark to New York segment in significantly greater numbers than Amtrak’s intercity ridership. The Gateway Program requires over 10 miles of new trackage to bring just two new tracks into Manhattan from New Jersey. The Hudson Terminal Plan, by contrast, takes advantage of existing rail infrastructure to bring four tracks to New York with just 4,100 feet of new trackage—the distance from Hoboken to the western banks of Manhattan. Further, even though Amtrak’s ridership is dwarfed by its commuter railroad counterparts, the Gateway Program does little to improve conditions for NJ Transit and MTA LIRR riders. One element of the Gateway Program, the $1.5 billion Moynihan Station development, would create a new train hall for Amtrak, but would be completely unconnected to NJ Transit’s southernmost platforms. 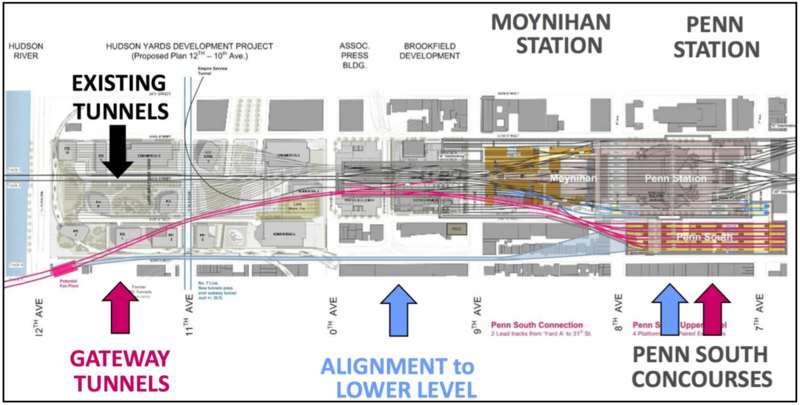 In addition, where a large portion of Amtrak’s Penn Station concourse space is currently inaccessible to NJ Transit and MTA LIRR passengers, it is unclear whether the completed Moynihan Station project will similarly prevent access to those riders. Finally, despite calling for 10 miles of new trackage, the Gateway Program lacks a dedicated rail link to Manhattan for passengers traveling along NJ Transit’s Hoboken Division lines. This connection would, for the first time, provide passengers along NJ Transit’s Main Line, Bergen County Line, and Pascack Valley Line a one-seat ride into Manhattan at relatively minimal costs. Instead of relieving congestion along the existing Newark to New York alignment, Amtrak’s Gateway Program doubles down by bringing more trains along the same path into the overcrowded Penn Station complex and further dividing up concourse spaces into two additional station structures. Even though it is increasingly difficult to secure funding and commence large-scale projects in New York, the Gateway Program also falls short by relying on a fragmented approach to modernizing New York’s rail infrastructure. As proposed, the Gateway Program would, upon completion, result in the creation of two new station tracks leading to four new platforms that terminate one block south of the current Penn Station site. However, in order to bring its next-generation, high-speed rail through New York, Amtrak would have to construct (at later unspecified date) two additional station tracks along a lower alignment through the Penn Station complex as well as an additional sub-level concourse deep below the proposed Penn Station South structure. In other words, at the completion of the Gateway Program, the $15 billion spent on track and station improvements offer, by Amtrak’s own admission, only a partial solution to the problem, and the remaining costs and timeline for completion of the additional improvements have not yet been identified. Because of the dense infrastructure already in place in the vicinity of Penn Station, it is unclear how this fragmented approach to planning will impact the feasibility of the proposed improvements. For instance, in order to prevent the closing out of the proposed Gateway Program alignment through the Hudson Yards real estate development, Amtrak has already begun construction of a two-track shell within the project site. Amtrak has not, however, secured the proposed lower alignment for its second pair of station tracks, which would seemingly travel from the Gateway Tunnels’ Manhattan entryway along 30th Street. It is also unclear, from an engineering perspective, how Amtrak will construct both a new 7- Line Subway spur and high-speed rail line under 30th street considering the existing north-south subway lines it would have to traverse, including the existing 7-Line’s tail tracks beneath 11th Avenue. 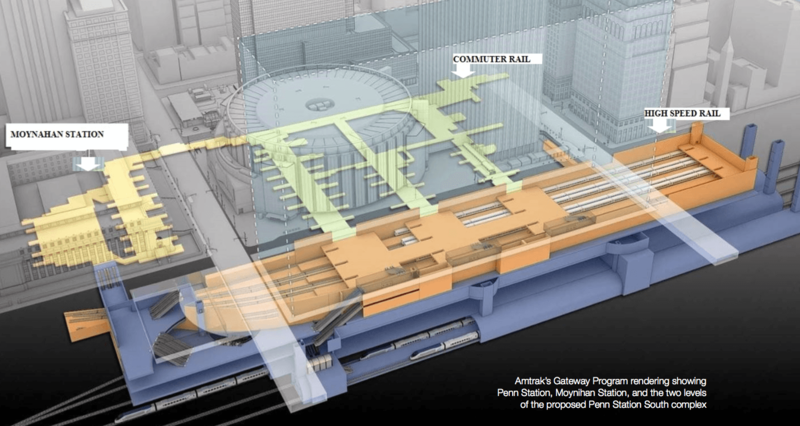 Amtrak’s Gateway Project also fails to fix the fundamental flaws with Penn Station’s design and layout. Penn Station South will neither contain a unified, central concourse nor open air spaces—two vital components of a successful transit hub. Instead, the Gateway Program does the opposite; it creates an additional disjointed space deep below the street level. 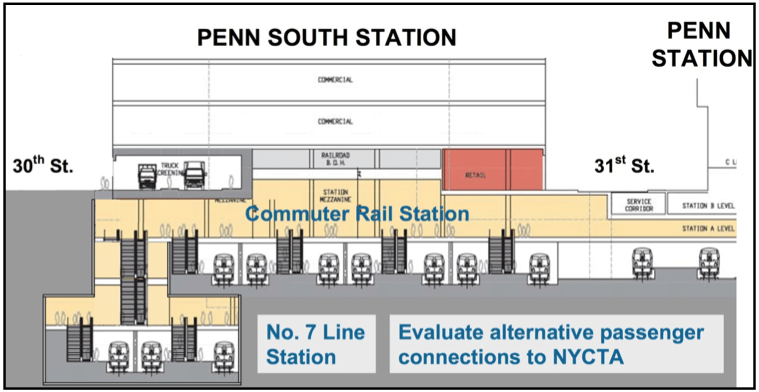 In essence, Penn Station South proposes the creation of two additional sub-level concourses alongside the existing sub-level concourses within Penn Station. Even if Penn Station South incorporated these necessary design elements, the Gateway Program still requires the demolition of scores of private buildings and residences across three midtown blocks in between 30th and 31st Streets and 9th and 6th Avenues. While a transportation project like the Gateway Program will likely succeed in seizing contested properties along its proposed alignment, eminent domain battles take significant time and financial resources to fight and threaten projects from getting off the ground at all. During the decades it may take to secure the approvals and properties necessary to implement the full Gateway Program, the Hudson Terminal Plan and Phase I of the proposed improvements to the southern section of the Northeast Corridor could already be completed. Lastly, and perhaps most disappointingly, despite its large cost, the Gateway project does little to improve Penn Station’s track and platform capacity constraints. Over the last several decades, rail use by the New York metropolitan population has been increasing at a much greater rate than general population growth. Since 1976, the number of daily trains that travel in and out of Penn Station has doubled, while the total population in the New York metropolitan region has increased by only 13%. Despite the expected growth of regional and commuter rail ridership within Penn Station, Amtrak has proposed increasing train capacity by a mere 48%, from 62 trains per peak-hour to 92 trains per peak-hour. Perhaps this increase would serve the at-capacity demand for rail travel already congesting the system. But if demand for rail travel continues to grow at the current pace, the Gateway Program, which is scheduled to be finished by 2025, will be inadequate upon its completion. The Hudson Terminal Plan, on the other hand, proposes the construction of a new four-track tunnel that will increase peak-hour train capacity in Manhattan by nearly 100%. However, even if NJ Transit were able to fulfill the increased hourly train capacity under the Gateway Program, it would still have to greatly increase its service, which would require the purchase of new rolling stock, construction of new train yards, hiring of new conductors and maintenance workers, and leasing the new trackage from Amtrak’s Penn Station South. Given that NJ Transit has operated at an average annual loss of over $1.4 billion for the past three years, it is unclear how it would be able to absorb the broad expansion of rail service needed to utilize the improvements proposed by the Gateway Program. 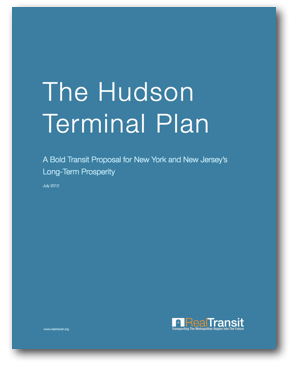 By contrast, the Hudson Terminal Plan takes advantage of the over 300 daily trains that already travel to and from Hoboken Terminal, but are currently underutilized because they lack a rail link to Manhattan. Unlike the suggested improvements to the Northeast Corridor contained in the current proposal, Amtrak’s A Vision for High-Speed Rail in the Northeast Corridor proposes two separate phases of upgrades to the northern section of the Northeast Corridor. For its first phase, estimated to be completed by 2025, Amtrak proposes $4 billion in upgrades to the existing Northeast Corridor from New York to Boston, including track, signaling, electrification, and station improvements. For its second phase, Amtrak proposes constructing an entirely new alignment from New Rochelle to Providence with intermediate stops in Danbury, Waterbury, and Hartford. While details such as precise alignments, delineated improvements, and sources of financing are unspecified, Amtrak estimates that its second phase of improvements to the northern section of the Northeast Corridor will be completed by 2040 at a cost of $58 billion. If implemented, both phases of improvements to the northern section of the Northeast Corridor would offer significant benefits in terms of service, speed, and reliability for rail travel in between New York and Boston. In addition, by including intermediate stations in Danbury, Waterbury, and Hartford, the proposed alignment would open up new markets to high-speed rail. However, Amtrak’s proposed improvements do not go far enough in establishing the foundations for a broader-reaching, high- speed rail network in the Northeast United States. Whereas an alignment traveling to upstate New York would allow for the seamless incorporation of a northern spur to Albany or a western spur to Pennsylvania, Amtrak’s proposed alignment travels east from Penn Station, through Queens, and ultimately to New Rochelle for its first stop, which is located on Westchester’s eastern coast. Under Amtrak’s plan, future expansion to Albany, Montreal, Buffalo, or Scranton would require the future construction of an entirely new alignment out of Manhattan. In addition, the proposed high-speed alignment does not go far enough to expand service to other underserved markets. From New York, Amtrak’s proposed alignment would travel through some of the most heavily saturated areas within the metropolitan region, which already have access to an existing selection of diverse transit options, including high-speed rail. The existing density around the proposed stations would not only limit the effectiveness of inducing demand and raising capital through TODs, but would also increase the costs associated with securing the proposed right-of-way and constructing new tracks and stations. Further, a proposed station at White Plains Airport, which was contained in Amtrak’s 2010 report, was removed from its 2012 report pending future discussions with local and state officials. It is critical that any proposed high-speed alignment traveling from New York incorporate access to a “fourth” international airport in order to ease congestion within the existing three airports, expand access for the metropolitan region, and induce ridership demand for the system as a whole. However, even if a link to White Plains Airport were constructed, it would not go far enough to expand air service to the region due to existing space and operating limitations. By contrast, the suggested alignment contained in the current proposal would introduce new service to underserved markets in northern New Jersey and upstate New York by way of not only high-speed rail, but also new commuter rail connections and expanded air service at Stewart Airport. 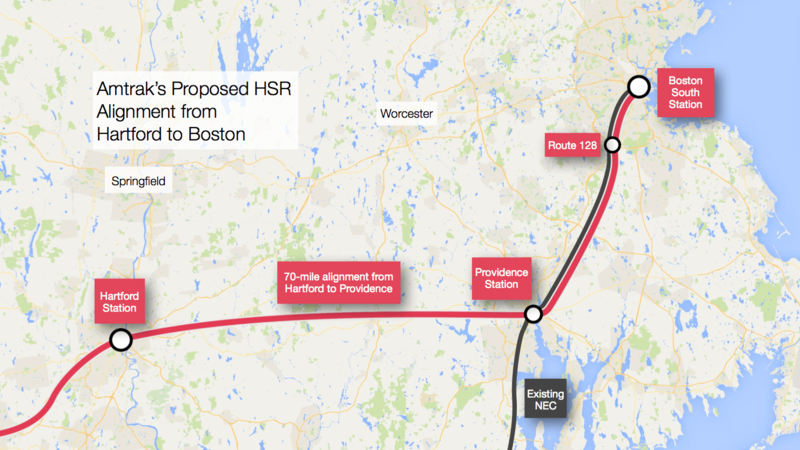 In New England, Amtrak’s proposed alignment would, for the first time, provide high-speed service to over one million residents of the greater Hartford area. However, by proposing a route that would travel directly from Hartford to Providence, Amtrak has chosen to prioritize speed over expanding service and reducing cost. In terms of population, the Springfield and Worcester urban areas are approximately the same size as the Providence urban area. However, unlike Springfield and Worcester, Providence already has access to high-speed, express service along the Northeast Corridor. From Providence, an Amtrak Northeast Regional train currently makes the 50-mile trip to Boston in just 47 minutes at an average speed of over 60 miles-per-hour. By contrast, Amtrak’s Lake Shore Limited currently makes the 92-mile trip from Springfield to Boston in 3 hours and 17 minutes at an average speed of just 27 miles-per-hour. In addition, a direct Hartford to Providence alignment also fails to capitalize on existing interstate highway right-of-ways to reduce costs. Whereas a Hartford to Boston alignment that travels through Springfield and Worcester would be able to utilize existing right-of-ways along Interstates 90 and 91 to reduce construction costs, there is no interstate highway that connects Hartford and Providence. Thus, the construction of Amtrak’s proposed alignment would require the seizure of over 70 miles of right-of-way from properties in Connecticut and Rhode Island. There is no question that Amtrak’s Hartford to Providence alignment will be faster (albeit marginally) than an alignment through Springfield and Worcester. But, compared to current conditions, both alignments will offer dramatically reduced travel times from Boston to New York. In bypassing Springfield and Worcester, however, Amtrak’s alignment fails to maximize the benefits of over $60 billion in estimated improvements to the northern section of the Northeast Corridor. Amtrak estimates that the total cost of its overall plan will be approximately $151 billion (in 2011 dollars) over 26 years. While annual capital expenditures would average under $1 billion during the first five years of implementation, Amtrak predicts that annual expenditures would climb to an average of $8 billion (in some years over $10 billion) over the course of the subsequent decade. 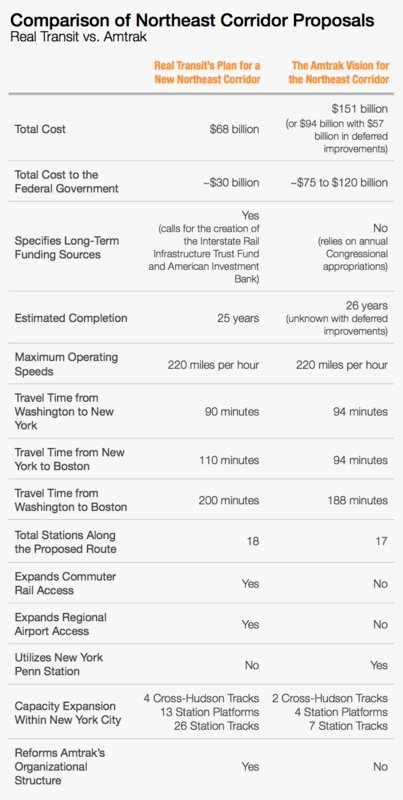 In spite of these estimates, Amtrak admits that annual capital expenditures in this range are “too high to feasibly achieve.” As a result, Amtrak has proposed deferring $57 billion in Northeast Corridor improvements until after 2040, although Amtrak does not specify what improvements would be deferred or when they would eventually be completed. Amtrak also fails to identify any concrete source of funding for any of the proposed elements of its overall plan. Amtrak does, however, offer several general sources of funding for the various segments of the overall project, including access fees, various local and state taxes, and private sector support. In terms of federal support, Amtrak identified the need for “federal funding guarantees as a ‘backstop’ to enable Amtrak to raise private funds at preferential rates,” as well as sustainable subsidies “not subject to the uncertain annual appropriations process, [as to] provide consistent support over the long-term.” The problem with relying on long-term federal support, as opposed to a self- replenishing trust fund, is that it is impossible to ensure that appropriations will remain steady throughout the life of the project. If history is any indicator of the future, the wide fluctuations in Amtrak’s operational and capital expenditure subsidies (operational subsidies were temporarily eliminated from 1999 to 2002) should provide ample caution for any financial structure based on annual congressional appropriations. Amtrak also projects that the combined improvements to the Northeast Corridor will increase overall ridership from 11.9 million riders in 2010 to 43.5 million riders in 2040. In turn, Amtrak projects that Northeast Corridor operating revenues will increase from $900 million in 2010 to $4.9 billion in 2040, and operating profits will increase from $142 million in 2010 to $1.7 billion in 2040. In other words, Amtrak projects that over the next 26 years, Northeast Corridor revenue growth will eclipse expense growth by 40%. While it is unclear how Amtrak will achieve this feat, what is even less clear is how these added profits will be reallocated among Amtrak’s profitless routes. In the last ten years alone, Amtrak has accumulated over $11 billion in operational losses, of which its profits on the Northeast Corridor have helped to cover deficits on Amtrak’s long-distance and state-supported routes. Even if it were able to grow revenues and contain costs on these routes at the same rates as the Northeast Corridor, Amtrak as a whole would still operate at an annual loss of almost $300 million by 2040. More likely, however, these routes will continue to amass growing deficits. Over the last 25 years, ridership on Amtrak’s long-distance routes has actually declined by almost 15%, and today, on- time performance for long-distance trains is just shy of 55%. As long as Amtrak’s financial standing is, in part, dependent upon the success of its long-distance routes, not only will Amtrak’s high-speed rail plans face potential delays as larger operational subsidies become necessary, but institutional investors may also forego financing projects whose profits are reallocated to long-distance routes. From a normative perspective, the American public should not have to wait to receive the full benefits of high-speed intercity rail service so that Amtrak, a quasi-private corporation, can continue to maintain unnecessary, and highly unprofitable, long-distance rail service across the United States. Finally, The Amtrak Vision for the Northeast Corridor does not propose any changes to the fundamental organizational structure, management, or financing of the Northeast Corridor or Amtrak. In spite of the historical problems associated with Amtrak’s labor laws and union agreements, Amtrak’s plan does nothing to drive labor costs down. In spite of its lifetime of reliance on fluctuating federal subsidies to remain operational, Amtrak fails to put forth any long- term solution to its financing woes. And in spite of the rise of private rail operators in Europe and Asia (and proposed private railroads in Texas and Florida), Amtrak has effectively secured its monopoly on intercity passenger rail on the Northeast Corridor by including in its overall project cost nearly $8 billion in high-speed train sets and rolling stock servicing facilities. 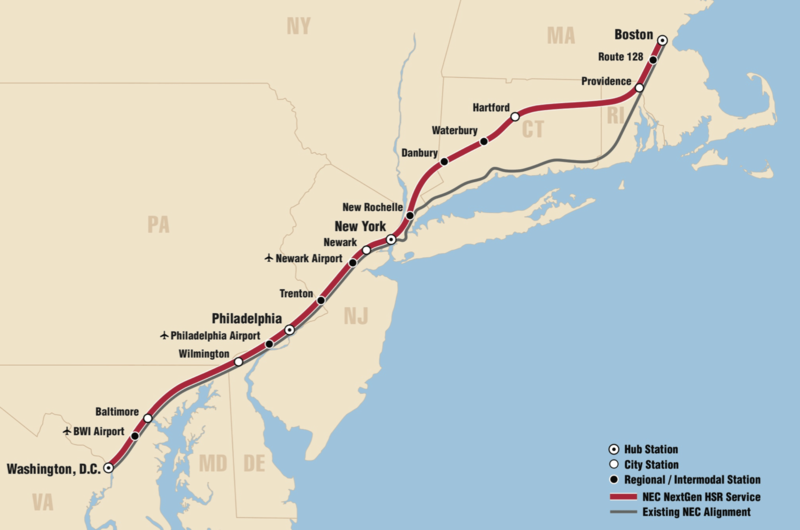 Overall, while The Amtrak Vision for the Northeast Corridor would provide a tremendous benefit to the Northeast Corridor region, it does so at unacceptable costs and fails to sufficiently improve the status quo in rail operations that has long hindered the development of a modern, high-speed rail network in the United States.